In these two dozen pieces, collected here for the first time, Sides gives us a fresh, alluring, and at times startling America brimming with fascinating subcultures and bizarre characters who could live nowhere else. Following Sides, we crash the redwood retreat of an apparent cabal of fabulously powerful military-industrialists, drop in on the Indy 500 of bass fishing, and join a giant techno-rave at the lip of the Grand Canyon. We meet a diverse gallery of American visionaries— from the impossibly perky founder of Tupperware to Indian radical Russell Means to skateboarding legend Tony Hawk. We retrace the route of the historic Bataan Death March with veterans from Sides’ acclaimed WWII epic, Ghost Soldiers. Sides also examines the nation that has emerged from the ashes of September 11, recounting the harrowing journeys of three World Trade Center survivors and deciding at the last possible minute not to “embed” on the Iraqi front-lines with the U.S. Marines. Americana gives us a sparkling mosaic of our country today, in all its wild and poignant charm.
. . . drops in on the charmed life of skateboarding icon Tony Hawk; studies counter-terrorism at the G. Gordon Liddy spy school; goes Hollywood with American Indian Movement radical-turned-movie-star Russell Means; steps out of the closet with Mel White, religious right ghostwriter-turned-gay activist; mushes the Iditarod Trail with Alaska legend Joe Redington.
. . . runs the rapids during a man-made flood in the Grand Canyon; crashes the redwood retreat of California’s elite Bohemian Club; debriefs the “bio-nauts” as they emerge from captivity in the Biosphere; dives into America’s greatest swimming hole; gets ecstatic with the Zippies at their secret all-night techno-rave.
. . . ponders silver bubbles at the annual Airstream RV convention; revs it up at the Harley-Davidson rally in Sturgis, South Dakota; sails the Chesapeake with snooty owners of a rare antique sailboat known as the log canoe; roams the streets with D.C.’s hard-core band of bike couriers. 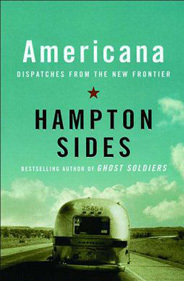 AMERICAN BY BIRTH, SOUTHERN BY THE GRACE OF . . .
. . . speaks in tongues with black Pentecostalists of the Memphis-based Church of God in Christ; fishes for lunkers at the Bassmasters Classic; goes underground with the world’s greatest cave rescuer; unravels the mystery of a notorious teen murder in rural Mississippi.
. . . crosses the Sahara Desert with American endurance runners at the infernal Marathon des Sables; bushwhacks through MesoAmerica with Mormon archaeologists in search of lost tribes of Israel; visits a high school friend who’s become an Uzi-toting Zionist pioneer in the West Bank; walks the route of the Bataan Death March with characters from Ghost Soldiers.
. . . cranks it up with high-end stereophiles at the Consumer Electronics Show in Las Vegas; gets bowled over by 5,000 squealing salesladies at the annual Tupperware convention; plumbs the mysteries of the “schwa” at the National Spelling Bee; scrapes at the stucco of the neurotic architectural tradition known as Santa Fe Style.
. . . traces the harrowing stories of three World Trade Center survivors; goes off-roading in the Imperial Sand Dunes; almost embeds on the Iraqi frontlines with the U.S. Marines; remembers Shane Childers, the decorated Marine who became the first American combat death in Iraq.